Yesterday was the kind of day I’ve been waiting for since winter arrived unexpectedly in November. Temperatures climbed above freezing, which felt almost balmy, and I spent nearly the entire day outside. After the oak leaves were raked and the remaining daffodil bulbs planted, I headed into the fields and down the road with my sketchbook. Shriveled wild grapes, thorny tangles of multiflora rose hips, and climbing vines of bittersweet not yet eaten by birds offered a bit of brightness against bare branches and brown grasses. They seemed the perfects things to sketch to capture the day. Tips and Techniques– If you want to sketch outside in cold weather, I suggest really paring down your supplies so that you have very little to carry or fuss with in the field. I bring only my sketchbook and a Micron pen. I don’t want to be pulling gloves on and off or organizing sketching supplies in the cold. I make mental notes of color or take a photo for reference, and paint once I’m home with a cup of tea in hand. 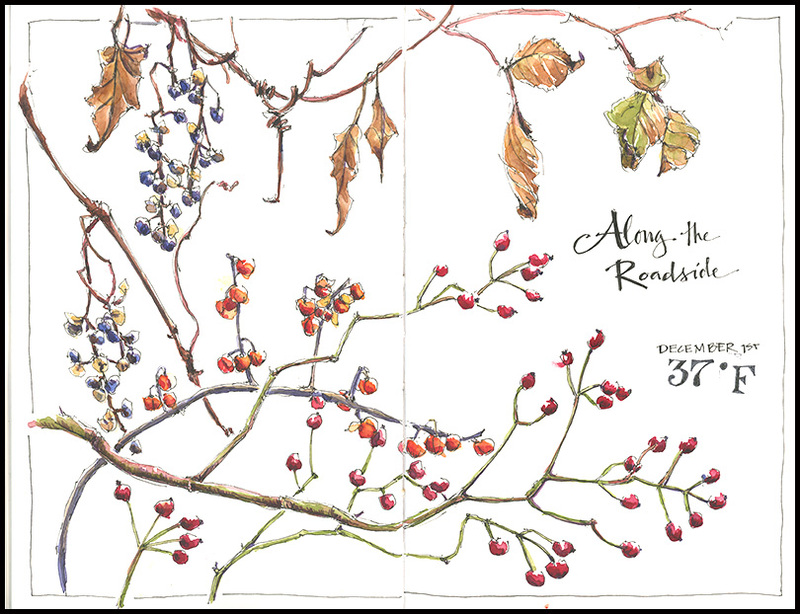 This entry was posted in Journal, nature and tagged natural history illustration, roadside wildflowers, watercolor sketch, winter by Jean Mackay / Drawn In. Bookmark the permalink. I was out too in the forest behind our house. I thought about you as I was observing much the same beauty. Since I haven’t drawn in some time, I take pictures and got a nice one of some tree fungus thinking “maybe I will sit down and try to draw it.” According to my photo app, it might be Turkey tail. Anyway just wanted to say how much I enjoy that you “see” so much beauty when I think many people rarely do. So true Mair. I like the idea of doing a series of Along the Roadside sketches. I did one in July as well and there are good year-round possibilities. Thanks Jill. I should add that I think you need commitment too. I have to tell myself that I won’t come back until I’ve found something to sketch, a prompt I sometimes need when it’s cold. I love how you find the beauty in the mundane. This is so expressive to me. I too often find myself looking intently at at the spent twigs and weeds on the roadside and think, ‘I want to sketch that and then I don’t. You encourage that thought in me to make it a reality. Thank you. I like this. Thanks Erica. I was thinking this morning about my tendency to paint spent weeds rather than gorgeous bouquets of colorful flowers as most artists do. Somehow, the flowers seem to get all the attention and speak for themselves, so part of my job is showing the beauty in the unnoticed. Thanks for writing — sketch what strikes you! Your tips could be just as relevant for a photographer – don’t want to be dealing with too many lens changes and stuff. Keep it simple and make mental notes, or just try to bring out the feeling of the place when you get back inside. I like the simplicity of just “Along the Roadside” and the date and temperature – 37 is still cold! Thanks– 37 is cold, yes, but I was just so glad it wasn’t 11 or 20 as it has been lately. I sketched outside once last year at 18F so that’s my benchmark. It’s been nice to see how much you’ve been getting out to photography and explore. I love photographing berries and things left behind in the early winter. The colours seem to pop particularly surrounded by dead leaves. I love these pages. I love to find the little pops of color along the roadside as I take my nearly daily walks. Textures and patterns are revealed so much more in the winter, too. Janice- I don’t see your email on my list of followers. You may need to sign up again. Let me know if you continue to have problems.